I made these cute K cup coffee holders for my coffee loving friends. They are the perfect gift to warm up on a cold day and give a caffeine boost for getting thru the winter blahs! The Stampin Up Coffee Break DSP #144155 was the perfect paper to create this holder. The sentiment is from the Coffee Cafe’ stamp set #143677 was a great addition to complete the gift. Cammie drew her inspiration for this adorable packaging from the sample on page 90 in the Stampin Up 2017-2018 annual catalog. She started with a mini pizza box #144645 that are still available and made a wrap using pool party cardstock, She then stamped the images from the Lemon Zest #145359 stamp set using Lemon Lime Twist Ink. She added a hand cut banner with the sentiment to create a fun gift box. Cammie went all out with the packaging for her Dec workshop. She purchased a glitzy mermaid stocking and added a sweet beachy tag using the Beachy Little Christmas #144854 stamp set from Stampin Up. The Beachy Little Christmas is one of the many favorites from the Stampin Up Holiday catalog that is on the Stampin Up Year End Retirement List. For my holiday packaging I went a little simpler than Cammie did. I purchased blue lunch sacks and ran it thru the Big Shot using the Winter Wishes Textured Impressions Embossing Folder #144686. I added tissue paper that I stamped using various snowflake stamps. The Winter Wishes TIEF is also on the Stampin Up Year End Retirement List. Be sure to check the list and order before it’s too late. Today’s post is a fun 3d pencil case that I created using the Pocket Framelits #143750 from Stampin Up. I cut 2 pockets and then added a continuous strip that was scored to connect the 2 pieces. Its fun how just by changing the colors how you can create something that was unintended. The width of the strip determines the depth and this really holds quite a bit of stuff. For today’s post, I started with a naked Tiny Treat Box #135829 and randomly stamped images from the Stampin Up From the Garden (no longer available) stampset. I also added an oval with the frame and sentiment froom the From the Garden set. 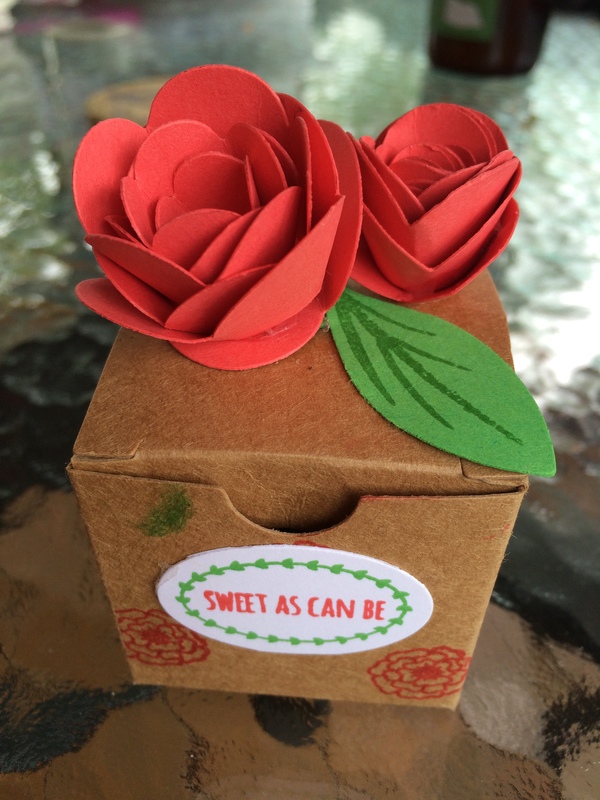 For the Top of the box, I added 2 roses cut using the Spiral Flower Originals die.#129379. Once the spiral is cut you just start at the skinny end and roll the paper around a pencil or paintbrush until you have it all rolled up. to resemble a flower. The tighter you roll it the smaller the flower. I added the flowers to the top of the box and added a leaf.